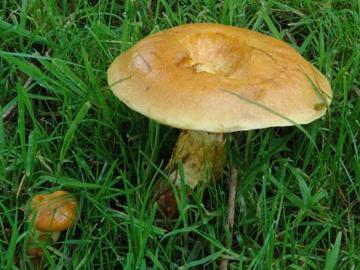 Bolete fungus with a smooth brown cap up to about 10cm across, varying from dark chestnut to light yellowish brown. The surface is slimy and glutenous, particularly when wet. The underside has yellow pores covered by a white veil, tearing to leave an irregular ring on the stem, which is straw coloured with darker markings. The spores are ochre of buff coloured. 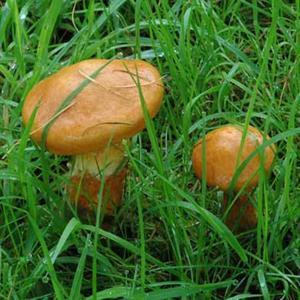 Often occurs in large colonies near pine trees and are produced from August to November. Usually grows in damp shady areas, in association with conifer trees. Widely distributed, native to Europe and North America, also occurs in parts of Austrlia and New Zealand.